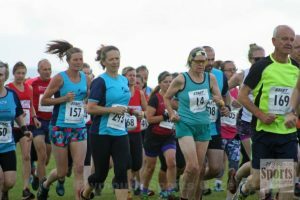 Lesley Pymm reports: It was a long time since I last ran this event, and there were a lot more runners there than last time. This meant that the first mile or so was pretty slow as the path narrowed and we all came to a halt. Eventually we managed to get going properly and it was a really great run. The first half is pretty much uphill, but not too steep. There were sections where the bracken was very overgrown and it was difficult to see where I was going. Compared to the Shropshire Hills, it was easy going. 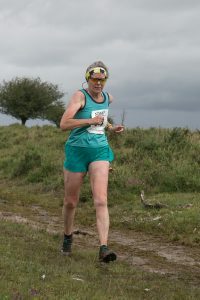 I was surprised at how many runners seemed to be trying to avoid the puddles – it was a moor run! Towards the end there was a massive puddle and it was not possible for them to run round it! Cattle in some areas, but not a problem. Great run – turned out to be about 6.5 miles. I think it may have been worth their while to think about running it in the opposite direction so that everyone can get going in the first mile or so. There may be a good reason why not. Great cake stall, technical T Shirt (if I do it again I must remember to order a small size), great atmosphere. This entry was posted in Multi-terrain, Race Reports by Race Reports. Bookmark the permalink.